When your opponent has faced up monster(s) on the field and when you have successfully Special Summoned a monster of 1500 attack points or less to your field, you may activate this card. 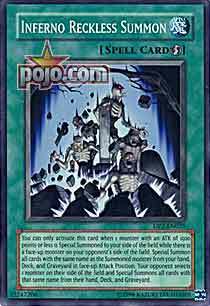 Special Summon any monster from your hand, deck, or graveyard that has the same name as the Special Summoned monster to the field in attack position. Your opponent also chooses one monster on his/her field and special summons any monster with the same name as the selected monster from his/her hand, deck, or graveyard to the field. Here's a reason to actually buy the Duelist packs! Inferno Reckless Summon has unlimited combo potential in the hands of a smart player. It requires an unusual setup but can be well worth it in the end if planned for correctly. If you Special Summon a 1500 or less ATK monster, you can pull out all the copies of it and your opponent gets to pull out all the copies of one of their face-ups. Obviously, the best plan would be to make sure your opponent can't pull anything and for you to get the most copies of the card on the field as possible. The best case scenario: You either Premature Burial, Call of the Haunted, or UFORoid out a Proto Cyber Dragon (Shining Angel --> UFORoid so you don't have to use any Tributes for UFORoid) while your opponent has a Restricted card on the field (Breaker/X-Force/DDWL/DDA/whatever.) You pull 3 copies of Cyber Dragon from your hand/deck/GY and your opponent gets absolutely nothing. I'd like to make a fun build of this deck because it'd not only still be cookie-cutter but it makes a great way to shove THREE cookie-cutter monsters into your opponent's face all at once. However, ATD (April Tewart's Day) could change all that depending on the banlist differences. Dark Paladin Welcome to a new week of cards. I'm not sure exactly what if at all the theme for this week is, but for the first time in a while we aren't looking at horrible cards. Today we look at Inferno Reckless Summon, a very interesting card that I have some mixed feelings about. You can only activate this card when 1 monster with an ATK of 1500 points or less is Special Summoned to your side of the field while there is a face-up monster on your opponent's side of the field. Special Summon all cards with the same name as the Summoned monster from your hand, Deck, and Graveyard in face-up Attack Position. Your opponent selects 1 monster on their side of the field and Special Summons all cards with that same name from their hand, Deck, and Graveyard. That's quite an effect. I see a few decks this could actually work in. First, a Battery deck. Special Summon a Battery Man AA and then pull your other two out. What do you have then? Three micro monsters with 3000 attack points each! This one may not be as applicable, but you could also use it in an Ojama/Ojama King deck. Even though the monster summoned has to be the same, so you can't summon all three Ojamas, it will give you weenie swarm and help you pull of some combos. Finally, this is also a bit of a stretch, but in a King of the Skull Servant deck perhaps? Get out all three of your Skull Servants so they can easily be destroyed to more quickly power up your King I suppose. Now, the second part of the effect. Your opponent chooses one of their monster, and they get all of the above mentioned fun except they can choose ANY monster on their field. However, I don't see this as a problem. Activate this card when they have something really weak on their field in defense posistion, or when they have a restricted card like Jinzo or DD Warrior Lady out. Or, make sure its a monster you KNOW they only run one of. This provides you with an interesting way to get three identical monsters on the field (so you can use Delta Attacker! ), which could make certain sorts of combo decks easier to use. However, you should only use this card if the only monsters your opponent controls are restricted, so you are the only person getting advantage. Also, the restriction of Special Summoning the monster is a tad difficult to get around (unless trying for Delta Attacker, where you've got Soul Resurection! ), and The Shallow Grave won't help you. But still, interesting. Someone may one day find a way to break this. When I finally learned the true effect and rulings of this card, I cant help but say I was a little disappointed. Inferno reckless summon is a pretty wicked card, allowing special summonings of multiple monsters with 1500 atk or less if you special summon one. Basically this is for decks that run multiple Weenie clones. Its also great when combo’d with Proto Cyber Dragon, as im sure your all aware of. Unfortunately, Inferno reckless does have its restrictions, for instance, it can only be activated if the opponent has a face up monster. Also, it cant be activated during the resolution of a searcher effect like Mystic tomato‘s, which really hurts its playability. Oh yeah, the opponent gets cards too, so just say your playing a Dark Magician deck, then they can hit you with 3 DM’s and your wall of Cyber’s are blocked. Traditional ; 2 .5 /5 That cyber combo is pretty cool…. Art : 5/5 I was glad they kept the or8iginal art in this one, about time. MPS : 4/5 its really anime, in the way that mass special summoning always happens. Today's card is cool, but hard to use. I have been working on ways to abuse it with proto-cyber dragon and armed dragon lv. 3, but just randomly throwing it in a deck hurts its playability. In a deck dedicated to its use, it is easy to pull off. But honestly, the card becomes a bad draw if you have no way to meet its requirements. etc. Special Summoning your monster us still tough. Stats : Inferno Reckless Summon is a Quick-Play Spell. It would be worse as a Trap (not a surprise) but if it created a lasting effect on the field, a la Last Will, it would have been better as a Normal Spell. Effect(s) : When you Special Summon a single, 1500 ATK or less Monster to your side of the field and when there is also at least one face-up Monster on your opponent’s side. You then get to Special Summon all other copies you have of the card from your hand, graveyard, or deck. Your opponent then selects one of their face-up Monsters and does the same. This is quite nice if you can pull it off. Combinations : This could be pretty sick when combined with Last Will. Of course, you want to save the combo until you have a clear field, but at the same time it allows a ferocious swarm at any time: early game when your opponent’s nastiest cards are still locked away in your deck and late game when they are already gone, in the graveyard. Imagine a Tomato-Control deck using this: Mystic Tomato dies, fetches a Cannon Soldier. As long as you can take out any blatant defenses (e.g. they have a set S/T, you Dust Tornado it) you can Last Will, use Cannon Soldier to launch itself, get a Don Zaloog, activate Inferno Reckless Summon. Now all you need to do is clear out their face-up Monsters, which shouldn’t be too hard since even though they may have gotten up to two more… you still have your Normal Summon (Exiled Force, a D.D. Monster, etc.) and all your other Monster Removal Spells. Then watch them cringe as Don after Don attacks: even if they have enough Life Points to survive, their hand will be decimated. However, that’s probably not going to be happening anytime soon. You see, come April, Last Will becomes one per deck. Last Will was vital to many rogue decks (and pretty sweet for some more mainstream decks as well), but with cards like Don Zaloog (and Proto-Cyber Dragon) that Last Will gets out so easily, things would get pretty broken, pretty fast. Since the Summons should usually be coming all from deck or Graveyard… who cares if the whole shebang gets sucked into oblivion via a Dark Hole next turn? Most of the time, you can probably just wait out a Breaker or something and then Smashing Ground it after Inferno Reckless Summon resolves. Here is where we have some disappointment. Unless they’ve changed the rulings, you can’t activate a Spell like this when something like Mystic Tomato resolves in the damage step. So that option is out. What is left for decks in general? Not much: Premature Burial and Call of the Haunted but that’s about it. Still, for Tomato-control… that might be worth a single copy of Inferno Reckless Summon at least side-boarded. There are some specialty decks that can still make use of this card. If you want to run a Batteryman AA deck… then yeah you want this: you can use Battery Charger to Special Summon a Batteryman AA from the graveyard, activate Inferno Reckless Summon, and you’ve got three Level 3 3000 ATK Monsters. And if they all die, the same combo gets them all back again. Up to two more times. I was thinking about Gilasaurus, obviously as an early game surprise: at that point, it’s doubtful they have anything in their Graveyard. So the first Gilasaurus is Special Summoned, you use Inferno Reckless Summon, and you have three expendable weenies on the field… provided they have a Monster face up. Combine it with the right Tribute Monsters and you could have a fun deck. I can see it maybe working with the Monarch Monsters, or my favorite… Gilford the Lightning. After all, he’d clear out all their Monsters and let you hit them hard. Heck, even though they are puny, 3 Gilasaurus are still something. You know, it would be nice for a VWXYZ deck. The Union effect Special Summons the Union Monster from the S/T zone. This can let you quickly get the smaller pieces into your Graveyard, where they can be removed from play for several worthwhile effects… then using Return from the Different Dimension, custom assemble the Fusion of theirs you need. Roll Out can get one piece from the Graveyard and equipped to a legal target in one shot, allowing you to then de-equip it. All in all, it will require thinking outside of the box, but this card will definitely see play. Traditional : 1.5/5 – Nope, too hard to get the effect and make it worth while. Maybe it could be risked in some OTK decks that could use the extra Summons. Advanced : 4/5 – For the decks that can use it well, like Batteryman AA. In general, it’s about two points lower. Limited : 1/5 – Odds are you won’t have anything to trigger it, and even if you do… how likely are you to have multiples of it? A good card that can lead to some major advantage if used properly. However, frustration over it not working in response to a searcher like Mystic Tomato dying in battle, coupled with the need to play some cards perceived as “bad topdecks” means it probably won’t see the play it deserves. This card has actually intrigued me. Unlike most cards that are out, this one could actually see play. The ability to swarm is very very nice, especially when it doesn’t have to cost you’re your entire hand. The activation requirements are understandably controlled: if you special summon a monster with <=1500 ATK, and your opponent has at least one face-up monster, then you get the other copies of yours and he can do the same for one of his monsters. This is a rather situational activation requirement. Fortunately the opponent will most likely not have other copies of said available monster, if you play it right. These means the use of this card has to be skilled. The best suited use of it is a Marauding Captain -> something drop. This done when they have a restricted monster on the field, and while the other copies are either in the deck or grave, if they are in the hand then you won’t be seeing much benefit. My personal favourite use of this card is a drop to Proto Cyber, if you do this since Proto is currently named Cyber Dragon you get to bring out 3 Cyber Dragons to either fuse of just pound away. Naturally this type of deck would focus on OTK, but it would be rather unstable. For more stability you are best off running it as a tech in a Cyber Fusion deck, focusing instead on Light Hex to grab the fusions. Relying on this card is a stupid idea. Coin Flip This bears mentioning: This card can't be activated in the Damage Step. I assume, of course, that all of you are intelligent people and can make that assumption about every card in the game (except where it doesn't make sense), but that actually needs to be said again, apparently. This card makes Last Will ridiculous. And Book of Life/Spirit Reaper, and Proto Cyber Dragon, and I'm not even going to mention the ridiculous things this does to the Gravekeeper archetype (hint: Play IRS when Necrovalley isn't out, then play Necrovalley). The fact that it pulls from Graveyard is more impressive; even if you've already used this on one monster, a Premature Burial makes it good a second time. Or there's the ridiculous interaction with this and either Swarm of Scarabs, Des Lacooda, or Swarm of Locusts plus a stall card or two. Heck, throw in Stealth Bird. It's easier. This card is perhaps the most balanced card to come out of GX yet. Get a few. It works well in the odd GK or Zombie deck using Book of Life, Lacooda and Spirit Reaper. Combined with, say, a used up Magical Merchant, you're in for pain. But there is too great a level of complexity to the potential this card brings to give it a number rating. Have a nice day.